Who cares? I certainly don’t. That’s how the cookie crumbles. A project manager will often disregard or dismiss people’s opinions. But if the business people working on the project have a negative attitude, project execution becomes harder. Next their opinions are heard by managers and the project manager must spend a lot of time making explanations. 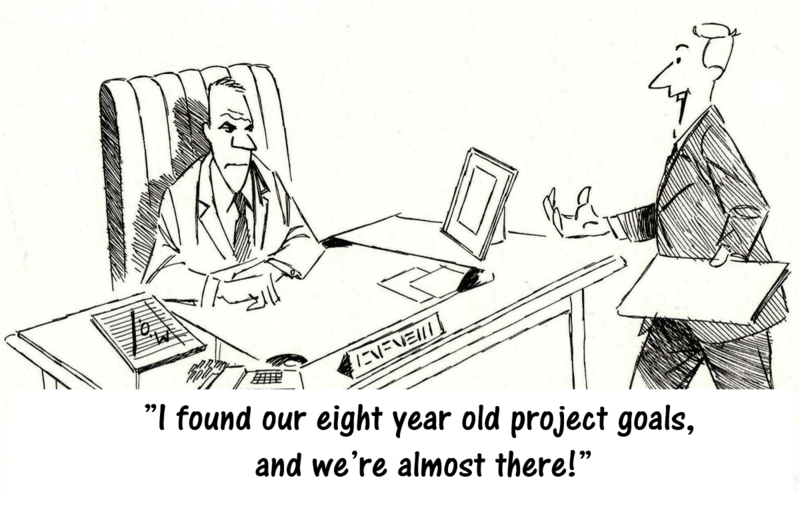 The project manager will have trouble getting good resources to work in the project. Project meetings are skipped, because people just don’t prioritize them. Project deliverables start looking negative even though they may be in truth ok. People’s motivation lowers and working is certainly not fun. This adds up, and delivering a successful project becomes ever more difficult. How to prevent a negative atmosphere from developing? You could spend your time sitting in that coffee table killing each rumour one at a time. This just isn’t a very productive method, especially if the project is large. The better option is to prevent the negative atmosphere from being born. To truly manage the project and do right things at the right time. To reserve the time needed to think ahead and resolve upcoming challenges before they turn into problems. A skilled project manager isn’t the one who saves the project, but the one who prevents his project running into trouble in the first place. This is not an exhaustive list by any means. What I listed are things that result in dissatisfied, grumbly people. When planning the project, plan also the reporting. Make sure your project management tools and methodologies enable real-time reporting. This way you have the chance to successfully manage the project. People need to be able to post questions and development ideas to the project through an official, systematic channel. Not around the coffee table. Note that this doesn’t mean that every answer will be satisfactory or that every question is answered right away. Questions often contain answers – by listening to the questions, you often receive clues to upcoming issues and can prevent them from becoming problems. The definition must be done using modern methodologies. Do not fall into the trap where the vendor’s consultant asks a whole bunch of questions and makes notes that turn into a giant definition opus. This is a sure way to derail the project in the very beginning, and sure to result in heavy costs later. Progress tracking during execution phase must be carefully planned. Testing can’t start before execution is complete. It is an often-made mistake, that testing is started as planned, even though the solution isn’t ready. A critical point comes, when the solution is handed over to the customer for testing or end user training, for instance. If the first contact with the new solution is a negative one, people’s faith in the project wavers. Make a communication plan and stick to it. Communicate actively and truthfully. Reserve time for project management. Hurry is the worst excuse for not doing things properly. We are planning a new development project. How do we make it a success this time? Before starting a new project, it pays off to analyse what problems you have previously faced. Be sure to also find out what went well and why. When planning a new project, I do it from end to beginning. All the while I analyse what problems we may encounter. The aforementioned report planning doesn’t take up much time anymore since I utilise the Quality Gate Best Practice model, which, by itself, enables real time reporting.